After last weeks’ loss to an impressive Weston Super Mare I said I would take a few days to have a think about if I was the Welling Manager how would I send the team out for the next match? Well a few days have passed, lots of thought has gone into it and then when I finally come to a decision Jamie Coyle uses his Maidstone influence to bring Harry Phipps back to the club and gives me an extra problem to deal with! Harry is a 19 year old midfielder that spent six games with Welling a couple of months ago, so we have an idea what he can do. He scored two goals and despite his age showed composure and class, he is also tall and good in the air so can give us an option from set-pieces. Injury cut short his time with us in September and when he recovered from that he went straight back into the Maidstone match-day squad,which is where he has been for their last 5 games. For this reason I was quite surprised to hear that we had re-signed Phipps, albeit on loan but I guess Coyle convinced Jay Saunders that match-time was what the lad needed and that at Park View Road he could get plenty of that. All this means that I probably need to find a space for him in my starting 11. After a while of playing around with some formations and line-ups I can see no other option than for us to continue to play a 4-5-1 line-up. I would love to get two forwards onto the field and play 4-4-2 but it is harder to remove the extra midfielder then it is to leave a striker on the bench so 4-5-1 it is. I need to start somewhere so lets start by putting in the bankers. 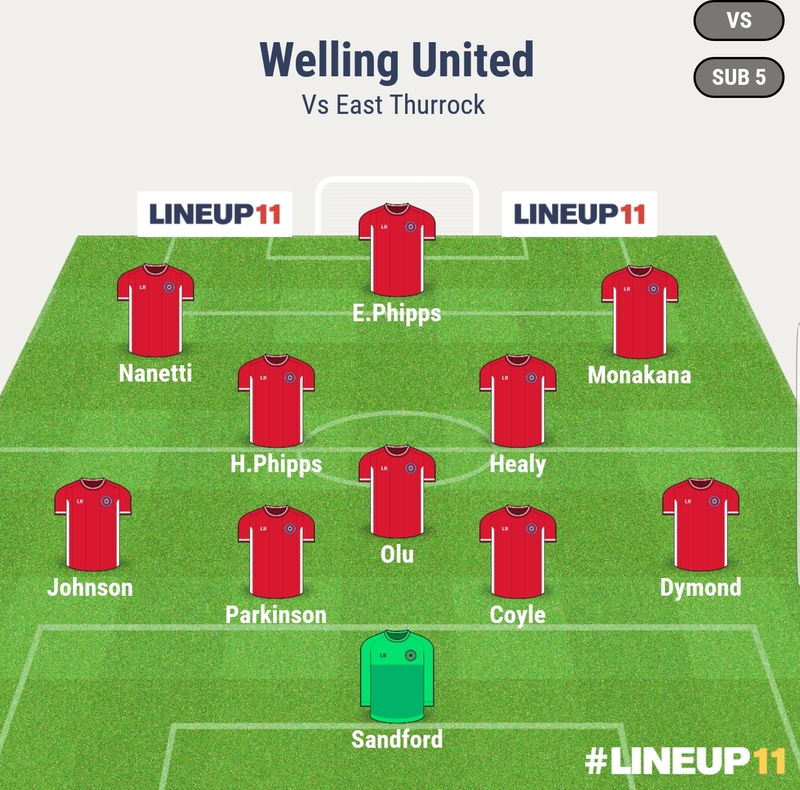 The guys that 99% of Welling fans would put in the team. Without trying to spend too much time talking about our goalkeeper, Sandford gets in because Perntrou is unfit and we have this new young keeper from Millwall on loan and no other choice, so he is in. Connor Dymond is the Captain. His only competition for the place is Gayle, and Dymond is the choice from those two. He is Solid, tough in the tackle and an easy pick for right-back. Next up is ‘Jeffrey’ Monakana. Our left footed right-winger gets in as although he can frustrate with inconsistency he has the class to win games for us. Sometimes the kids in Danson Park are on the end of his crosses and on others Joe Healy is. From the options we have and also due to him being recently signed on a long term contract he gets in. We are getting there! Now for the two remaining spaces in the centre of midfield. The options are Harry Phipps, Olu Durojaiye and Jack Jebb. Olu has been great for us this season, was voted supporters player of the Month for October and his form has been a big reason why Joe Healy has been able to perform so well. I believe talks are ongoing in respect of trying to tie him down to the club so he is clearly highly thought of. Jack Jebb is a quality footballer. He went through the Arsenal system and you can tell. On the ball he can be great to watch and his set-piece delivery has been key for us. He is young and does have mistakes in him. Maybe sometimes he needs to realise that at this level ugly can work. Then of course we got Harry Phipps in this week. As mentioned before, I like his quality and I don’t see how he would have come here just to sit on our bench. It seems unfair on Jebb but he will be the one missing out this weekend. Left-Back…. Tough one this. A straight up battle between Ben Jefford and Archie Johnson. This position is also interesting as Archie could easily be the left-winger. Jefford got sent off against Wealdstone a few weeks ago giving Archie his opportunity and he really has seized it. He flies down the wing and has contributed to a couple of goals in those games. Sometimes you need to look at facts and his crosses have directly produced goals whereas his potential main rival at left wing, Christian Nanetti has not been as productive even though he has spent four or five times as long on the field. Therefore an easy option is to put Jefford at Left-Back and Johnson at Left-Wing but I know the manager sees Archie in the more defensive role and for that reason, alongside rewarding current form and due to those beautiful overlapping runs, Archie gets in at Left-Back. Until a new option is found this leaves Christian Nanetti as the favourite to play in the remaining wide role. If you thought Monakana could frustrate at times then Nanetti raises the bar in that respect. The home faithful hold on to the memories of what he did last term when he got numerous assists and multiple penalty decisions but arguing against that it seems that the referees have him on the naughty list and we have suffered a few times this season for his reputation at going down softly. You also have to wonder if Adam Coombes considerable finishing talent made Christians’ delivery seem better than what it was. However it can be great fun watching him run towards a frightened right-back and if his decision making and crossing was as good as his step-overs he would be an easy choice. As I have picked Archie in defence then the only other options on wing would be Eli Phipps or maybe even Bradley Goldberg. I will rule out the latter of those choices first as I know Bradley does not like the position. He is not suited to tracking back so I will leave him to solely compete for the forward position. Eli Phipps. I like this kid. Apparently so do the management team do as they are trying to turn his loan from Colchester into something more permanent. He is up for consideration in a wide role after performances from the bench in recent games when Welling were behind and his introduction and goals helped to grab points. On these occasions due to Tom Bradbrook being on the pitch Eli was based in a wider-than-central position. This led to some hard work in training working on tracking back and the defensive side of the role before starting out wide against Weston Super Mare in The FA Trophy. Unfortunately, for me, this experiment failed. He was up against a tough team and swapped sides with Monakana at half-time but it just didn’t work. The square peg didn’t fit and for this reason I will not be picking him as a wide player. This leaves it as Nanetti as the winger, so although I can see and would accept the argument of having a left-side of Jefford and Johnson, my left-side will be Johnson and Nanetti. Now for the striker! We have three options and any would be a confident selection to be fair. Tom Bradbrook is a tough guy. He gives us a great aerial prescence. He can hold the ball up and scores plenty. He will be a great asset throughout the Winter as the pitches get worse and the management team seem to favour him especially on the bigger pitches away from home. Bradley Goldberg is the opposite to Tom, small, skillful and is good on the ball. He can be a constant threat, was impressive at a higher level and is certainly a player I like. Eli Phipps could have a good future in the game. He has great touch, scores goals and is far from the finished article. Selection time! I am going to put Bradbrook on the bench, I like him a lot but when he is on the pitch we play too direct. I feel we have decent footballers in the team and I wonder if we get the best out of them when constantly firing it long and high. Going on form I will play Eli Phipps over Bradley Goldberg. Like I said I believe the kid is a talent and already a well-rounded player that can bring a bit of everything to the position. So that is my team and I am going with it. I don’t expect it to be the one that starts on Saturday as the left side could be controversial and Bradbrook will probably play. I am also not aware of injuries or abscences so that could dictate selection aswell. It is worth noting that I am over the moon with the job the Management team are doing and have really enjoyed the League games this season and wasn’t expecting to be around the play-offs at this stage of the season. Feel free to leave feedback or your team picks which I can add to the thread if you send me it, please do! These views were just my own mad ramblings with no insight into team matters other than watching on a Saturday afternoon.